Greater Manchester Chamber of Commerce invited me to present at their Manufacturing & Engineering review with a focus on supply chain opportunities created by Electric Vehicles (EVs) and Connected and Autonomous Vehicles (CAV). Read more about it here. National Physical Laboratory (NPL) invited me to present at a Future of Transport event, in which the NAA was a partner. This event was held in Huddersfield, which was fantastic as we interacted with many companies that we’ve not spoken with before. Yorkshire and Humber is a region where we are keen to grow our presence in 2019. Of course, there were some familiar faces too! Great to see NAA members Klarius in the crowd. EEF were invited to speak at our last event on the topic of Industry 4.0, which gave our members some great insight into the core benefits to digitalisation, and the perceived ‘barriers’ to starting on that journey. Link to BWS event review. Looking forward to collaborative activities in the not so distant future, we are exploring a combined event with the University of Salford and Transport for Greater Manchester on the topic of CAV. 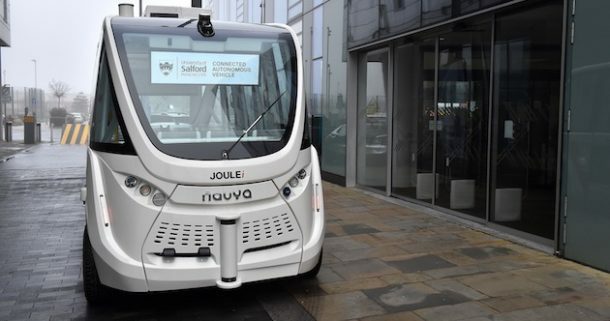 The University of Salford is planning to trial the autonomous shuttle bus shown in the photograph above on the roads around Media City. We have also fixed a date for a combined event with Warwick Manufacturing Group (WMG) called ‘Ready for Electrification’. This event will give our members a chance to speak with WMG’s ‘Electrification team’ who are industry experts dedicated to helping companies become part of the emerging EV supply chain. If you want to know more about the EV market and learn what support you can access, then save the date – Wednesday 22 May. In recent months I have also been signposting our members to the digitalisation opportunities available through the Made Smarter pilot and to procurement opportunities available through our new Procurement Hub. NMCL Automotive is a programme that utilises the NMCL system within the automotive supply chain. Managed by the Society of Motor Manufacturers and Traders (SMMT), the programme will use £16m of government funding to support over 100 companies through training, coaching, mentoring and consultancy. Support can be offered to a wide range of automotive vehicle manufacturers as well as the manufacturers of automotive components, accessories, software and production equipment. The intent is that we will include a segment of one of our upcoming events to focus on NMCL, but in the meantime please direct any inquiries to Steve Collins (scollins@smmt.co.uk). I would also like to take this opportunity to thank Mark Stein for his two years of contribution to the NAA Advisory Board. He has been a fantastic source of knowledge for the NAA, and for me personally since joining last year. With that, I would like to welcome James Brindley to the Board, Financial Controller at JLR’s Halewood plant, and already an active participant with the NAA.